The Trevor Project has announced the official launch of its new merchandising initiative, Trevor Gear. The marketplace storefront features apparel, buttons, stickers, and accessories sold at no premium or mark-up, ensuring this not-for-profit store serves to raise awareness for the leading provider of crisis intervention and suicide prevention services to lesbian, gay, bisexual, transgender and questioning youth, ages 13-24. 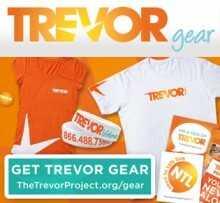 Trevor Gear is available at TheTrevorProject.org/Gear. Trevor Gear products include t-shirts in four different styles and designs, including unique ombre dyes, fitted, scoop-neck and crew-neck. All shirts are 100% ring-spun cotton and made in the USA. Stickers, buttons and silicone wrist bands that raise awareness about the Trevor Lifeline and NTL, short for “Need to Talk Live,” are available in quantities ranging from 1-100. Supporters can also show their LGBT Pride with stickers available in the same quantities. Posted August 3rd, 2012 & filed under News.